Ras Kimono, a giant of Nigerian music for over three decades, has passed away. He died yesterday morning. 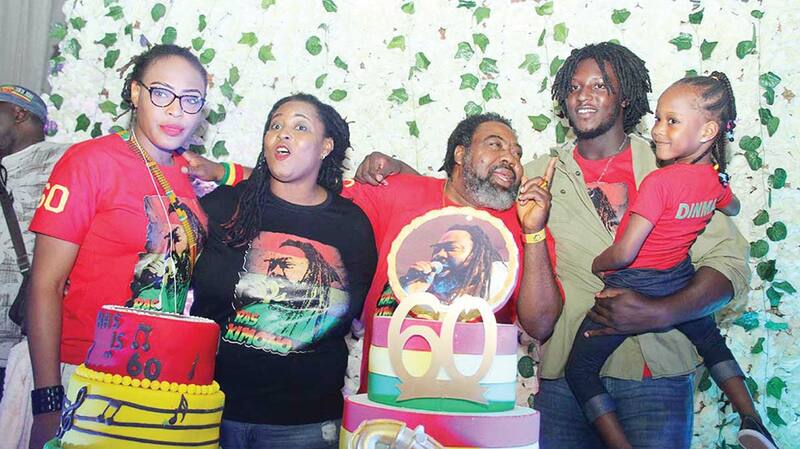 Born on May 9, 1958 to parents from Delta State, he recently celebrated his 60th birthday amidst fanfare. Respected for being a dogged fighter and stickler to perfection, the late musician, performed with top reggae artistes such as, Shaggy, Shaba Ranks, Lee Perry, the late Lucky Dube, Culture, Inna Circle, Steve Wonder, Eve and K.C. and JoJo and a host of others. He developed his own style of root reggae music that skillfully blended his African roots with classical Jamaican rhythm. This unique genre took him out of the country, where he played in major concerts in the United States, England, Italy, Kenya, Ghana and Papua New Guinea where his Benson and Hedges stadium concerts attracted a record average of 45,000 people per concert. The last time he visited The Guardian office; he brimmed in confidence, promising to change the trend of music in the country. He was dressed in a white top, with green, black, yellow and white stripes. He had a blue jean trouser, with brown trainers. His beret was green, yellow and red. He had eyeglasses on. Looking every inch younger, except for the frame that had grown heavier. “Our music is growing. My only disappointment is that nobody is playing live music anymore. Everybody is miming and that’s not good for professional instrumentalists in the music industry,” he said. He breathed life to the discussion so much that you’d think he had death in his pouch. But all was a dream. As his name Onwubuya ‘Death is sorrowful’ suggested, death has really brought sorrow to an industry that has suffered so much death in the last few months. Reacting to the news of Ras Kimono’s sudden death, the MD/CEO, Anambra Broadcasting Service, Uche Nworah, said the late reggae artiste died a legend, on and off the stage. “I’m the person that called Eddie Lawani to find out before he drove to the hospital. I’m on my way to the hospital to meet with Eddie, but my heart cannot carry it. I just parked to reply your message. I’m so shocked to even write a tribute. This is one musician that never had issues with anybody; he was never part of any problem in the industry. Honestly, I don’t know what to write; I can’t even move from here,” Okafor said. For Nollywood filmmaker, Emma Isikaku, the news was a big surprise. Reacting in Lagos to the death of one of Nigeria’s most loved musicians of the last three decades, COSON Chairman, Chief Tony Okoroji said, “Kimono was not just a great musician but a truly fantastic person. He had no angst against anyone and stood for truth and justice at all times. I have not just lost a colleague but a valued friend. This is absolutely devastating. Shortly after receiving the news of the passing on of the great Ras Kimono, COSON Chairman Chief Tony Okoroji, top Board members, Sir Shina Peters and Maureen Ejezie, the General Manager, Mr. Chinedu Chukwuji, Head of Finance, Ms. Bernice Eriemeghe and key Consultant, Prince. Biodun Eguakhide who had visited Kimono the night before with Chief Okoroji, were at Lagoon Hospital, Ikoyi to condole with the family and ensure that appropriate arrangements are made afterwards. In his tribute to late Ras Kimono titled, ‘A good Brother returns to Jah! Emeka Oparah, a director with Airtel Nigeria wrote: “The last time I partied with Ras Kimono was in 2015 at Ember Creek, then on Awolowo Road, Ikoyi, with Orits Wiliki, Victor Eshiet, Tee Mac, Majek Fashek and Edi Lawani. It was an unforgettable night of Roots Rock Reggae and Rub-a-Dub. Ras Kimono, in spite of his bulk, something I complained to him about, was absolutely massive! He sang, danced, skanked and blew the sax like only he could do in a rumba stylee! “We’ve been meeting on and off events since then and Ras has always been Ras, full of Reggae; full of philosophy; full of inspiration; full of brotherly love. Now, what’s this news I’m getting from Lebanon that he’s gone ahead of Jah people to the Grand Lodge above to be with Jah? I know it’s not a joke for we do not joke with such stuff in Nigeria but why now? Over the years, Kimono was consistent with his brand of reggae music. Under Pressure, his debut album, released by Polygram International, in 1988, won the Gold Disc Award. The follow-up, What’s Gwan clearly surpassed the first. In fact, it won double Platinum. That album swept all major music awards in Nigeria including, Reggae Artist of the Year, Song of the Year, Album of the Year and Artiste of the Year Award. His next album, Run Fi Cover, came out in 1992 and it was master hit. In 1994, he released another hit album, Oracle of Jah and nine years later, he came out with Still I Arise. He also performed at the PANAFEST in Ghana, URTNA in Kenya, ROTOTOM Reggae Sunsplash in Italy, Golden Tones Reggae Sunsplash (Lagos and Kano, Nigeria), Vienna (Austria) and Essen (Germany). In the United States, Kimono performed in reputable clubs such as, New York’s Tramps, S.O.B. and MONDO Festival at the Central Park, B.B. King Night Club New York and Zanzibar Water Front Washington D.C. He also played at the Equator (Chicago), Carabana (Houston), Masquerade (Atlanta) and in various clubs in St. Louis.